Know how to treat spider bites. Knowing a few spider bite home remedies can be helpful when a bite from this common househeld pest occurs. Although some bites from many spiders are not harmful, others can be very harmful and even fatal. Since these creatures can live in tiny corners, nooks and crannies, they are very common in most households, and they often bite when disturbed. When a spider bites, it injects its victim with venom. The venom may affect the nervous system or the tissues around the bite. In some cases the venom can affect the human body's major organs. Fortunately, the venom of many spiders is not strong enough to be toxic. If possible, catch the spider that caused the bite and save it, either alive or in an identifiable condition. Do not touch the spider with your bare hands. 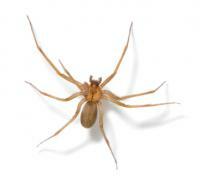 Preserving the spider can help an expert identify it in case there is a serious reaction. For common spider bites, issues include chance of infection, allergic reaction, and itch and irritation. 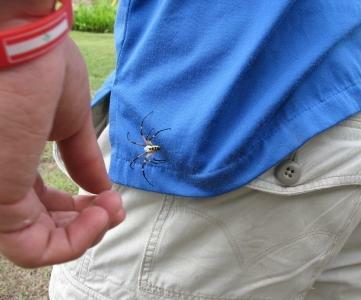 When a spider bites, it is possible that foreign bacteria from the puncture can cause infection. An allergic reaction from contact with the spider is another concern. Irritation and itching from spider bites range in intensity, and can be very mild or extremely uncomfortable. For most spider bites, home treatments are all that are needed. Treat a bite as you would any minor wound, cleaning it immediately. You can use ordinary soap and water, alcohol, or over the counter products designed to clean superficial wounds. Topical antibiotic ointments can also help reduce the risk of infection. Spider bites may cause itching, pain, irritation, swelling, or a combination of these things. Home methods to help alleviate these symptoms include the following measures. Applying cold, wet compresses or ice on the area affected by the bite is a simple way to help ease pain, swelling, and irritation. For common spider bites, elevating the area can reduce blood flow and offer some comfort. A paste made of baking soda and water applied to the bitten area may help alleviate itching and protect it from bacteria. A paste of crushed aspirin and water can help reduce pain. Aloe vera gel may help with both pain and itching. Dried basil, crushed into a sandy consistency and place on the bite, may help the itching and swelling subside. A paste of ground turmeric and olive oil may reduce redness and swelling. Over-the-counter hydrocortisone creams, calamine lotion, or other anti-itch medications can help ease itching. Take ibuprofen or acetaminophen to ease pain. An antihistamine, such as Benadryl, may help reduce the risk of an allergic reaction. 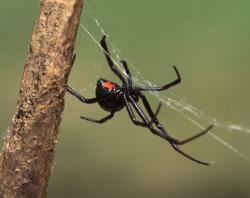 The brown recluse and the black widow are two spiders known for having severe and even lethal bites. To see images and more details of these two spiders, as well as other dangerous spiders, a spider identification chart can be helpful. Although it is difficult to eradicate spiders completely, there are some steps to keep spiders at bay and lower the possibility of a bite. Frequent dusting and vacuuming can help keep reduce spider populations indoors. Seal windows and doors well to allow fewer entry locations into the home. Keep weeds, brush, and debris near the home at a minimum. Be cautious when working in barns, outbuildings, basements, garages, attics, and storage areas, as spiders are more likely to popular these darker and less-disturbed places. Spider bites may be unavoidable, even with precautions. Fortunately, symptoms can be treated with simple spider bite home remedies. Always seek medical attention for serious reactions, bites from deadly spiders, or if you are in doubt.